Orbital ATK’s Minotaur-C roared into the sky at 2:37 p.m. PDT (21:37 GMT) on Tuesday, Oct. 31, 2017, from Vandenberg Air Force Base in California. 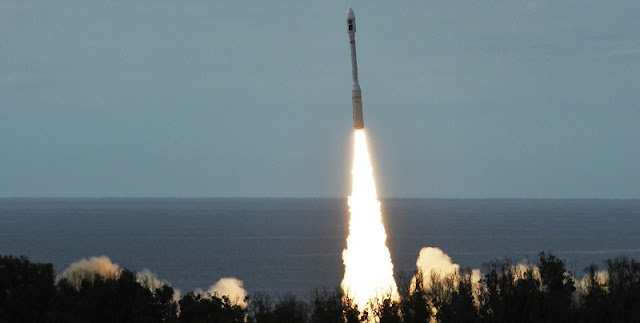 The Halloween-day launch carried six of Planet Lab’s SkySat high-resolution imaging satellites and four Dove CubeSats into a Sun-synchronous orbit 310 miles (500 kilometers) above the Earth. Together the remote-sensing satellite network of Dove CubeSats and SkySat satellites will provide global land imagery information to businesses, governments, and non-government organizations around the world. Liftoff took place from Space Launch Complex 576E (east), which was originally constructed as a test complex as part of the 576th Strategic Missile Squadron. The Minotaur-C (formerly known as Taurus) is a four-stage, solid-fueled launch vehicle capable of launching a payload of up to 3,500 pounds (1,590 kilograms). Manufactured by Orbital ATK, the rocket stands some 104 feet (32 meters) tall and weighs 170,000 pounds (77,000 kilograms). The version of the rocket used for this mission utilizes four Orbital ATK solid rocket motors as its propulsion system. The first stage (also called stage zero) used an Orbital ATK Castor-120, which is based on a Peacekeeper Intercontinental Ballistic Missile first stage. The second and third stages (also referred to as stage one and two) are Orion-50 boosters (similar to the Pegasus but without wings or stabilizers). Finally, the fourth stage (called stage three) uses an Orion-38 engine. Approximately 12 minutes into the flight, a total of 10 spacecraft were deployed for Planet Labs, Inc., a U.S. private Earth-imaging company based out of San Francisco, California. The SkySat constellation is now comprised of 13 satellites and is the world’s largest commercial fleet of high-resolution sub-meter satellites currently operating in orbit. Each of the six SkySat satellites comes equipped with a Ritchey-Chretien Cassegrain telescope with three 5.5-megapixel CMOS imaging detectors. Each spacecraft has a mass of approximately 265 pounds (120 kilograms) with dimensions measuring 24 by 24 by 31 inches (60 by 60 by 80 centimeters), and has a service life of at least 6 years. The satellites are designed to operate in a polar inclined, circular orbit at an altitude of approximately 280 miles (450 kilometers). Adding to its record-breaking 271-CubeSat fleet, four additional Dove CubeSats were also successfully deployed. Utilizing a large number of smaller spacecraft, more frequent passes can be made over a single ground location, allowing closer to real-time monitoring and time-sensitive imagery. The Dove “flock” collects more imagery per day than any other commercial provider. This was the second flight of 2017 for one of Orbital ATK’s Minotaur rockets. The first was the Aug. 26, 2017, ORS-5 mission from Cape Canaveral Air Force Station’s Space Launch Complex 46 located in Florida. Orbital ATK’s next launch is scheduled for 7:37 a.m EST (12:37 GMT) Nov. 11, 2017. The mission is being flown to send the automated OA-8 Cygnus spacecraft – named the S.S. Gene Cernan after the late Moonwalker – to the International Space Station on a cargo run. The flight will mark the second launch of the “230” configuration of the company’s Antares rocket. Liftoff will take place from NASA’s Wallops Flight Facility at Virginia’s Mid-Atlantic Regional Spaceport’s Pad-0A.